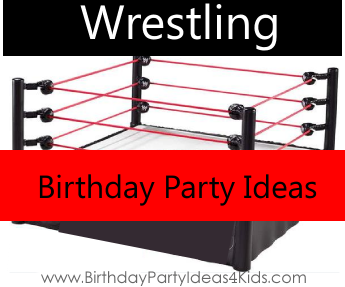 Fun ideas for a kids Wrestling Themed Birthday Party. Choose the best ideas that will make your Wrestling party unique and that will fit with your budget and ages of children attending the party. Before the party come up with wresting names for each of the guests. Make shirts for them with their wresting names or large stickers that they can wear throughout the party. Let's get ready to rummmmmbllllllle! Decorate the main table like a wresting ring. Two large ropes hung across the front. Use a white or black tablecloth and sprinkle red confetti or Wresting logos printed on the computer and cut out. Black, white and red helium balloons around the room and also tied onto the mailbox to show everyone where the party is located. When guests arrive give them their wresting names and then let them use face paint to create their own wresting persona. could use to make themselves look like a wrestler. If you have a trampoline with a net you could decorate it like a wresting ring and have mock wrestling matches (make sure a parent is there to referee!). Make up a large wrestling belt that the winner can take home as a prize. printed on the back for fun.